When the antibody is used at 1/2000 some lower molecular weight bands appear in COS-7 cells, the extent of which is significantly reduced when the antibody is used at 1/10,000. Our Abpromise guarantee covers the use of ab3682 in the following tested applications. Lane 8: untransfected cos-7 cells. 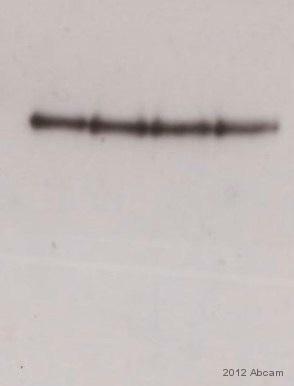 IP with 5 ul of polyclonal antibody anti CPS 1 (ab3682) Ab3682 can IP CPS1 transiently expressed in COS-7 cells. CPS1 - Liver Mitochondrial Marker was immunoprecipitated using 0.5mg Hela whole cell extract, 5µg of Rabbit polyclonal to CPS1 - Liver Mitochondrial Marker (ab3682) and 50µl of protein G magnetic beads (+). No antibody was added to the control (-). Proteins were eluted by addition of 40µl SDS loading buffer and incubated for 10min at 70oC; 10µl of each sample was separated on a SDS PAGE gel, transferred to a nitrocellulose membrane, blocked with 5% BSA and probed with ab3682. Secondary: Antibody to Rabbit IgG light chain (HRP) (ab99697). ab3682 staining CPS1 in mouse hepatic tissue section by Immunohistochemistry (Formalin/PFA-fixed paraffin-embedded sections). Tissue underwent paraformaldehyde fixation before heat mediated antigen retrieval in Citrate buffer and then blocked in maleate blocking solution for 30 minutes at 22°C. The primary antibody was diluted 1/500 and incubated with sample in maleate buffer blocking solution for 16 hours at 22°C. 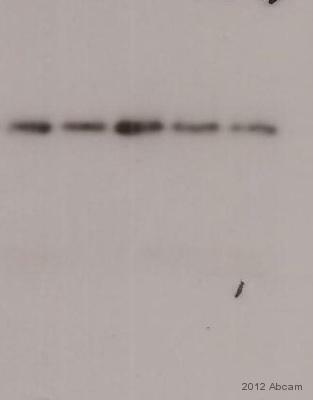 A Biotin conjugated donkey polyclonal to rabbit IgG was used at dilution at 1/250 as secondary antibody. 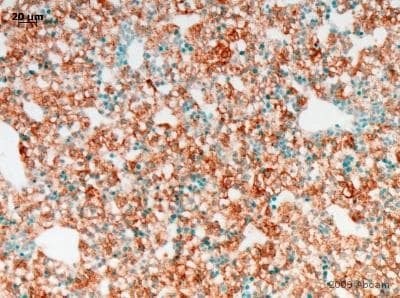 ab3682 staining CPS1 in mouse liver tissue section by Immunohistochemistry (Frozen sections). Tissue samples were fixed with paraformaldehyde and blocking with 100% maleate blocking solution at 220C for 30 minutes was performed. The sample was incubated with primary antibody (1/100) at 220C for 16 hours. 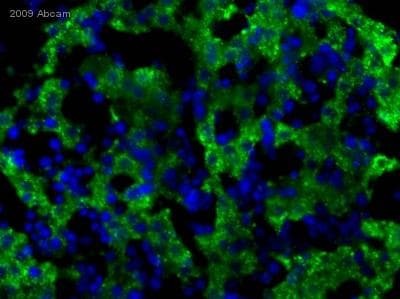 An Alexa Fluor®488-conjugated donkey polyclonal to rabbit IgG was used undiluted as a secondary antibody. 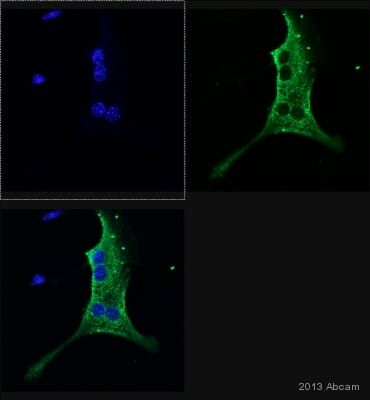 The image demonstrates CPS1 in green, nuclei stained blue with DAPI. CPS-1 localisation is consistent with the reticulated pattern of liver mitonchondria. Rabbit polyclonal to CPS-1 (ab3682), at 1/5000 on COS-7 cells transiently transfected with pCMV5-CPS 1 plasmid (Corvi, M.M and Berthiaume, L.G. unpublished data). Secondary: donkey anti-rabbit (Texas Red). Lane 3: ab3682 1/2000 Western blot using Rabbit polyclonal to CPS 1 (ab3682). Publishing research using ab3682? Please let us know so that we can cite the reference in this datasheet. Vielen Dank für Ihren Anruf heute Morgen. Ich habe mir die Beschreibung des IHC-P Bildes nochmals angeschaut und muss ihnen leider mitteilen, dass ich Ihnen keine genauen Angaben über dem Maleate Puffer machen kann, da dieses Bild und die Beschreibung nicht aus unsrem Labor stammt. Eine Kundin hat einen Abreview als Feedback mi t diesem Bild eingeschickt. Ich hoffe, diese helfen Ihnen weiter und wünsche Ihnen viel Erfolg mit Ihren Experimenten.